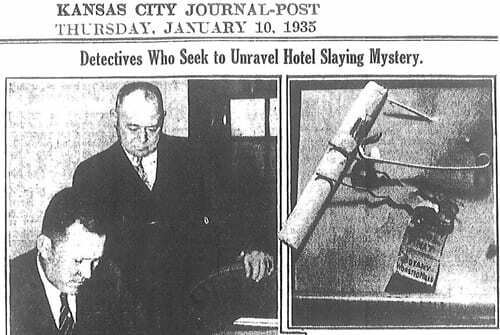 Just after lunch time on the 2nd of January, 1935, a young man entered the Hotel President in Kansas City, Missouri. He had no luggage with him but asked if he could have a room for the night. 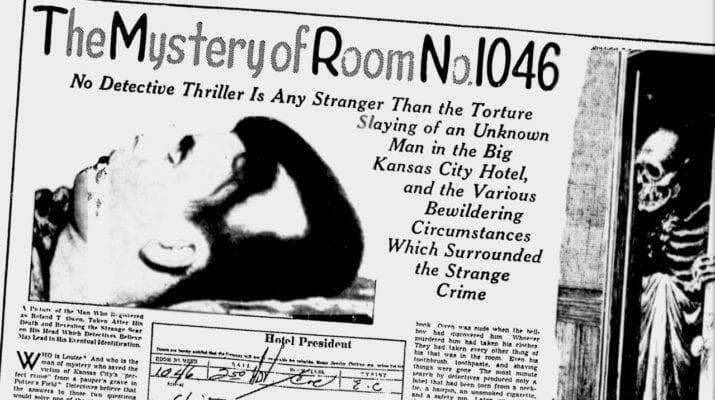 He signed his name as “Roland T. Owen” and was given the key for room 1046 on the tenth floor. Shortly after his arrival, a hotel maid arrived to clean the room. As she opened the door, she found the man sitting on the bed in the dark. Despite the fact that it was still light outside, he had tightly drawn the blinds, making the room pitch black. She recalled that the man seemed somewhat afraid or nervous. Of what, she was not sure. 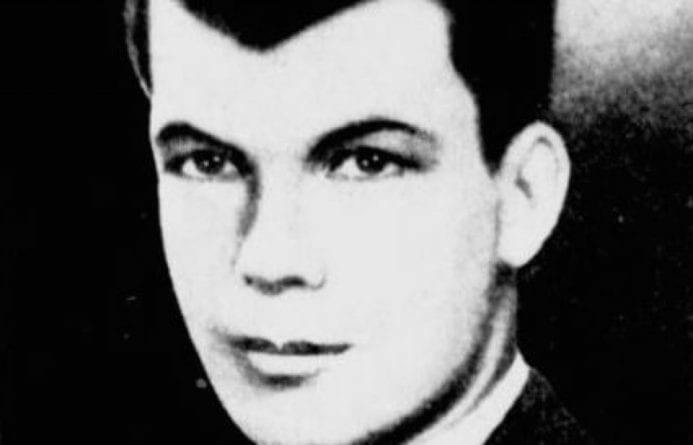 As she was cleaning the hotel room, “Roland T. Owen” put on his coat and left the room, asking her to leave the door unlocked because he was expecting a friend to arrive later on. 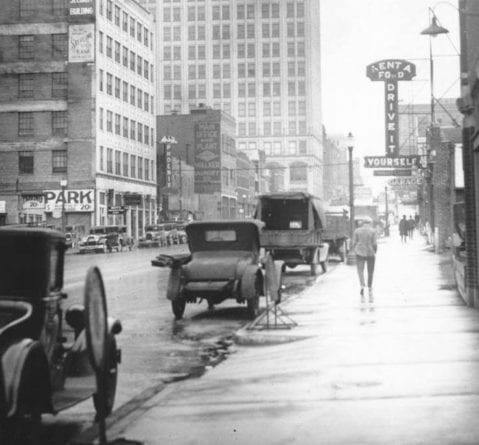 Kansas City in the 1930s. The following morning, the maid arrived to clean the bedroom. 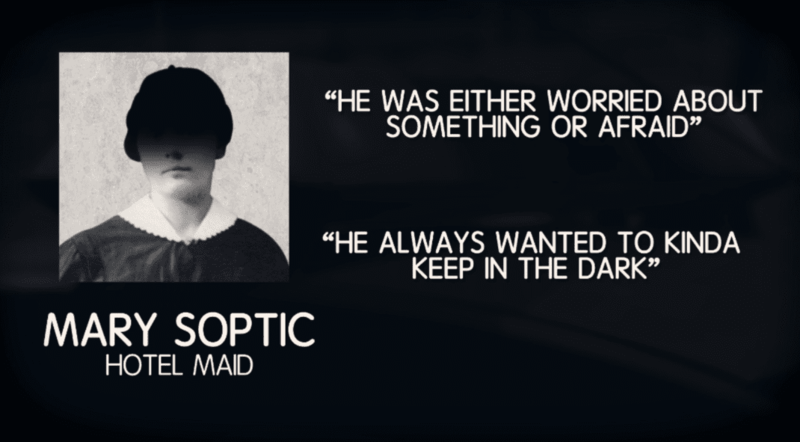 Once again, she found the man sitting motionless in the darkened hotel room. As she cleaned around him, the phone rang. Eavesdropping in on the call, she heard the guest tell the man on the other end of the line, who he identified as “Don,” that he wasn’t going to be having any breakfast that morning before hanging up the phone. Before the maid left, “Roland T. Owen” began to question her about her role within the hotel and what duties she was to carry out daily. When she returned later on in the afternoon with more fresh towels, an unidentified male grunted that they didn’t need any when she knocked on the door. At around 11PM that night, a local man called Robert Lane was driving downtown when he saw a man running down the street. He was wearing pants and a light shirt. It was an odd clothing choice for the brisk winter air, Robert thought. As he pulled over to ask if he needed any sort of assistance, the running man asked him if he could give him a lift to the Hotel President. Robert informed him that he wasn’t a taxi driver but would give him a lift nevertheless. It was much too cold for him to be wandering about in such inappropriate clothing for the weather. As the man climbed into the car, Robert couldn’t help but noticed that the oddly dressed man had a large bleeding wound on his arm and looked to be in a bad shape, as if he had been in some sort of physical altercation. Another guest later told police that at approximately 2AM, they too heard some sort of altercation coming from room 1046following which they heard a bizarre gurgling-like sound coming from the room. Back at the Hotel President the next morning, it was noticed by the desk staff that the telephone in room 1046 was left off the hook. Presuming it was an accident, a bellboy was sent up to inform the guest. When nobody answered, he used a master key to enter the room. At first glance, he saw blood spatter over the walls and the floor with some more spatter on the ceiling. He died later on that night after being rushed to a nearby hospital. An investigation of the room turned up nothing. Not one piece of clothing could be found and the complimentary hygiene products and towels had been removed by somebody. The weapon used to inflict the wounds on the man was nowhere to be found. Inside the bathroom, however, it was discovered that a water tumbler had been smashed but the jagged portion was never uncovered. 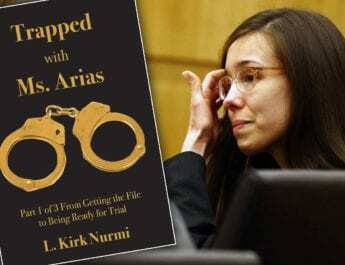 Could it have been the murder weapon? Due to the blood spatter near the bed, police surmised that the man had most likely been attacked while sitting or lying in the bed before being dragged to the bathroom. 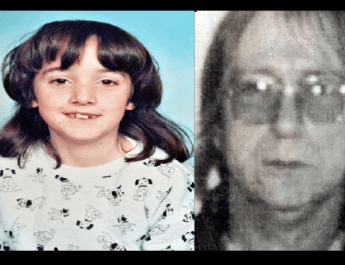 Detective Johnson suggested that the gurgling-like sound the other hotel guest had heard during the middle of the night was very likely “Roland T. Owen” gasping for air after the brutal attack. The man who had picked up the bewildered hitchhiker the night before recognised him immediately. Multiple people from separate establishments, including other hotels and even a wrestling arena, came forward to identify him. However, each person that identified him said that he gave a different name. As the weeks passed, the man remained unidentified, even though many could identify him by appearance. One bar worker came forward to tell police that he had seen the deceased man the night before he was murdered. 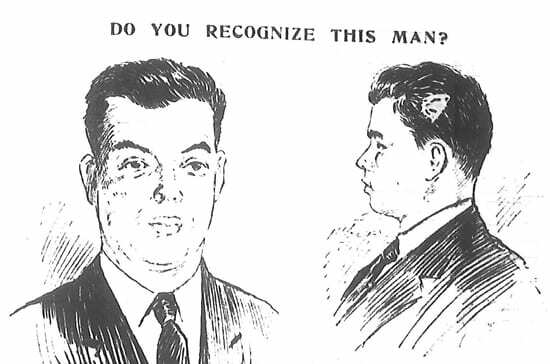 This composite sketch of Roland T. Owen appeared in the Star. He was in the company of two women, he contended. He was intended to be buried in the city’s cemetery for the unidentified but when locals caught wind of this, police received an anonymous letter from somebody who asked them to hold the burial off until they would be able to forward a hefty amount for a decent burial and funeral. 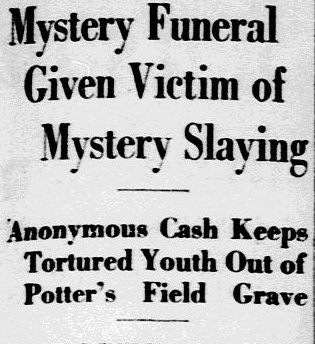 Days later, the money came in and he was buried in Memorial Park Cemetery. A local florist also received an anonymous donation for a bouquet of flowers that were signed off with “Love Forever – Louise.” Other than a couple of investigators working on the case, nobody attended the funeral. 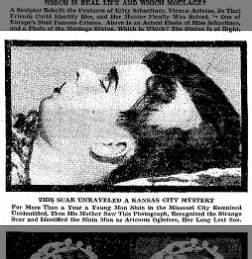 The case remained cold and his identity unknown until 1936, when Eleanor Ogletree read about the murder in The American Weekly. She believed the description of the man sounded like her brother, 17-year-old Artemus Ogletree, who they hadn’t seen since 1934, when he set off hitchhiking to California. The family had assumed he was okay because in spring of 1935 – months after “Roland T. Owen” died – they had received several typewritten letters from Artemus, claiming he was sailing to Europe. The family were initially suspicious of these letters because Artemus couldn’t type. A few months after receiving these letters, they received a phone call from a man who told them that Artemus had saved his life in Egypt and that he was happily married to a woman he had met during his travels. The caller told the family that Artemus wouldn’t be sending any more letters because he had lost his thumb during a bar fight. The caller sound rushed and irrational, the family said. The Ogletree family sent a photograph of Artemus to the Kansas City Police who confirmed their greatest fears. It was Artemus, they unfortunately confirmed. While Mrs. Ogletree had been receiving these mysterious letters and phone calls, Artemus was dead. While at least he was finally identified, this identification led to even more questions. Why had he used so many fake names? Who was the woman in his room? Who was Don? What happened to him the evening he was picked up by the driver? Who paid for his funeral? Who was Louise? Who sent the letters to his family? And ultimately, who killed him and why? To add to the mystery, all that was found in the room was a label from a tie (Botany Worsted Mills Company, of Passaic, New Jersey), a hairpin, a safety pin, an unlighted cigarette and a small, unused bottle of dilute sulfuric acid. The photo above right actually shows all these items except for the bottle of acid. 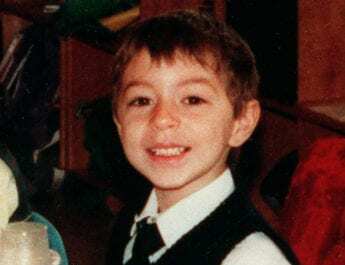 Do you have any theories as to who killed him and why? My thoughts are that he became involved with a well-off lady. He died whilst being ‘warned off’ by people that did not want him being involved with her. I only base this theory on a) the mystery lady paying for his funeral, and b) his somewhat irrational behaviour before his death – behaviour suggesting he was acting based upon his heart rather than his head. The fact that this was not solved would suggest not just money but power too. Not much of a theory, but the best I have. Isn’t this the story that the movie with JOHN Cusak was in?